We are no strangers to lighting effects, light boards and light walls here at PLuGHiTz Live. As a matter of fact, we are always in search of better lighting features and design. 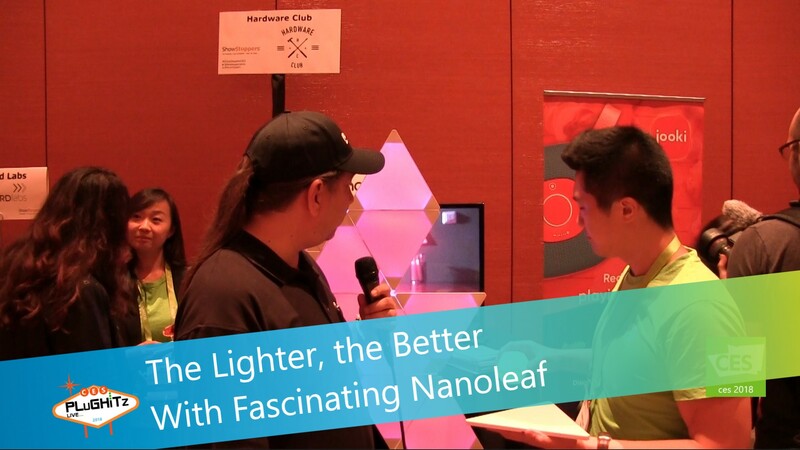 So when we came across Nanoleaf at ShowStoppers at CES 2018, to say we were excited would be an understatement. Nanoleaf is not just a light, it's an experience. It is comprised of lightweight triangular panels that actually enable you to illuminate your life in your own way, and change it up anytime you would like. The panels click together in any configuration you can dream of. Make a unique tower, or wall design and mix it up whenever you feel like it. Program various color schemes. You can awaken in the morning to sunlight and unwind at night with a colorful and soothing display. There's also an add-on rhythm module that will transform your music and allow you to immerse yourself in a symphony of light. We truly can't say enough about this incredible design. Whether for a bedroom, home theater or multimedia studio, Nanoleaf is a green solution for amazing LED lighting design. They offer a 9 piece starter kit for $199, and 3 piece expansion packs for $49 on their website.